Put on your chef's hat, and let's start enjoying some of these spring vegetables. And why not start with one of most delicious of all—asparagus. Asparagus is the first vegetable that comes up in a home garden in spring, and spring is the only time of year when fresh, crisp asparagus is widely available in grocery stores and farmer's markets. With such a limited window of time to enjoy it, asparagus needs to be savored while the eating is good. Asparagus is such a tasty vegetable that simplicity is the key to preparation. You can, of course, use asparagus in a variety of combined recipes, but to truly enjoy spring asparagus the very best strategy is to simply sauté asparagus spears and serve them largely unadorned except for a bit of butter. Adding a few minced herbs to liquefied butter, then tossing it with freshly sautéed asparagus, is ambrosia on a plate. To be ready as the asparagus becomes available, make a compound butter that is full of asparagus-friendly flavors, and keep hardened sticks in the refrigerator, available to use at a moment's notice. The asparagus season lasts only a few weeks, so prepare your herbal butter ahead of time and be ready for those delicious spears whenever they appear in your garden or in the grocery store. Four herbs are especially useful for bringing out the taste of fresh asparagus, whether you are serving spears as a standalone side dish mixed with butter, or adding asparagus to recipes. Snip fresh chives onto your sautéed asparagus spears just before serving. Chives appear in the garden at about the same time as asparagus, so gardeners may have fresh chives available for this purpose. The slight bite from the chives goes well with butter that has been flavored with a bit of lemon. Or, add chopped chives into any recipe calling for asparagus. The fresh taste of lemon is fantastic when combined with asparagus. Why not use lemon balm for that same bright flavor? 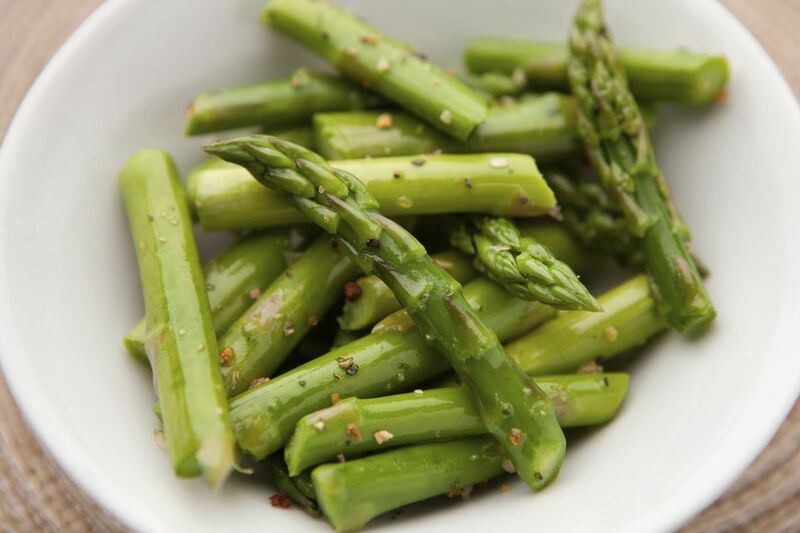 Snipping a few leaves into a bowl of steaming hot asparagus spears releases the flavor in a way few other seasonings can match. Lemon balm is a great addition to any asparagus recipe that also contains egg. The naturally sunny flavor of the lemon balm complements both foods and seems to marry them happily together. Be certain to mince the lemon balm before using it in egg recipes—using larger pieces of lemon balm can look unnatural when mixed in with the light-colored egg ingredient. Dill is familiar to anyone who has made or enjoyed asparagus pickles, but adding some dill to the butter before tossing with freshly cooked asparagus spears is also a great way to combine the two flavors. Dill is a wonderful herb to use in asparagus dishes, as it doesn't overpower the fresh taste while keeping it from tasting too bland. Gardeners who grow tarragon sometimes find that they don't know what to do with it once is harvested, but here's the answer: use it to add zip and depth to asparagus dishes. Since both asparagus and tarragon go well with eggs, these three ingredients make a great team in recipes prepared for light brunch meals. Tempting though it might be, you'll need to wait two or three years after planting an asparagus patch before beginning to harvest spears. Harvest too soon, and the root systems will never form the foundation they need to produce edible spears for many years to come. On the third year after you've planted, begin harvesting spears when they appear in the spring garden, snipping them off near ground level with a sharp knife as soon as they reach about 8 inches in length. Avoid harvesting the very thin spears, as these are immature plants that need further time to mature. Thicker spears must be harvested fairly quickly—if foliage has started to form at the top, it's too late to harvest them. Stop harvesting spears when the diameter becomes less than that of a pencil. This is the sign that the plant's roots need to rejuvenate. Allow these spears to grow to maturity and produce foliage, which will recharge the roots and prepare the plants for the next season. In the first few seasons of harvesting, the patch will produce spears for only about two weeks, but in subsequent years it may be productive for as long as eight weeks.